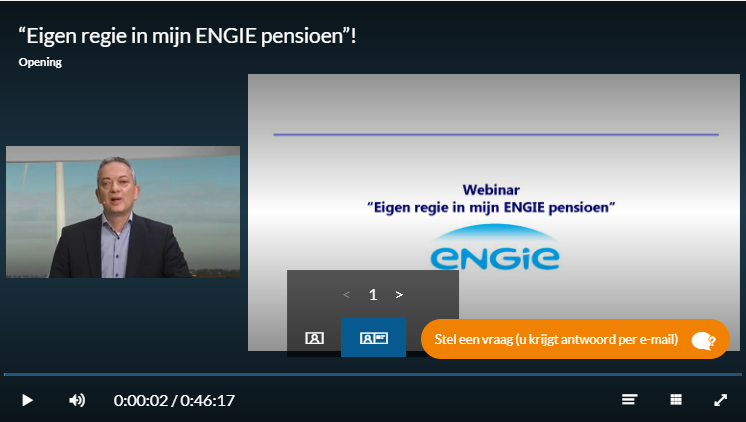 ENGIE has used a webinar to communicate with her staff about pensions. By using a webinar, ENGIE wants to give employees a personal experience and they want to ensure that they process the right information in an interactive way. Before, ENGIE communicated about pensions via written communications (newsletters) and intranets (notices). Now the organization has chosen to communicate about pensions to her employees via a webinar. The main benefits of using a webinar for communication about pensions were: personal approach, interactive transfer of information and the ability to convey the main topics in a proper way. The goal of using the webinar for communicating about pensions was to reach the audience in a better and more interactive way. ENGIE has more than 400 employees, spread throughout the Netherlands. With the webinar, ENGIE has reached number of employees it was hoping for. The webinar was promoted through direct channels, ICT and marketing. The use of the webinar for pension communication has made it easier for employees to take action and webinars improved the information transfer and explanation. The staff experienced the webinar as very positive, because of the pleasant and well executed information transfer. The employees didn’t only get more understanding of the matter, they were explicitly woken up by the webinar to take action: namely signing in to a retirement website and making a choice. What previously didn’t work with the old way of communicating, did succeed with the webinar. Employees were moved to action, there was a better way of communications and a better way to explain information. Want to know more about webinars for internal communications? Download our ebook Internal Communications Webinars.